Pelli Clarke Pelli Architects have won the international design competition for the Chengdu Natural History Museum in Chengdu, China. The studio’s design, created in collaboration with the China Southwest Architectural Design and Research Institute (CSWADI), swayed the jury panel. It was selected ahead of submissions from Zaha Hadid Architects, Sutherland Hussey Harris, Nihon Sekkei, Valode & Pistre and FUKSAS. Located in the eastern part of the city, the 62,700sq m (675,000sq ft) project will include spaces for permanent, temporary and interactive exhibitions, educational facilities, shops, a café, a cinema and outdoor social areas. The building has been conceived as a cultural landmark for Chengdu, which is in the midst of an economic boom as a new high-tech and entrepreneurial hub. Pelli Clarke Pelli’s design is inspired by the natural geological forms found in the nearby Sichuan Basin, created by volcanic activity and shifting tectonic plate movements. The central atrium will be a tall space dividing the building into two separate volumes. It will be filled with natural light from above, while a large entrance will connect the museum with surrounding gardens. A series of sky bridges will cross the atrium, connecting the exhibits with the public amenities on either side. Outside, reflecting pools and tributaries will frame the museum, evoking the region’s historic irrigation systems. 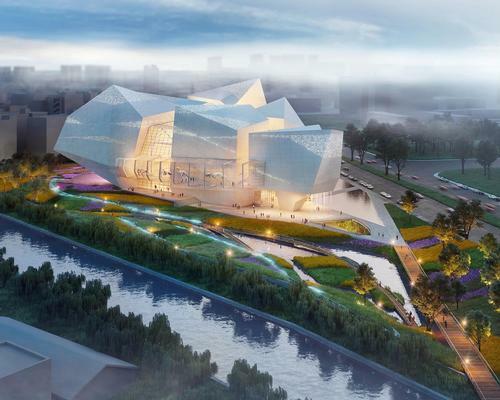 “We look forward to a strong partnership with our client and CSWADI toward creating a building that embodies the uniqueness of the city of Chengdu and the mission of this important cultural institution within the community,” said Pelli Clarke Pelli associate principal Kristin Hawkins. The Chengdu Natural History Museum is currently scheduled for completion in 2021.